If you've been into Godzilla or Japanese monster movies for any length of time, you've probably heard all kinds of rumors about how major Hollywood blockbusters have ripped off various obscure kaiju flicks. Of course, many (if not most) supposed instances of "inspiration" from Japanese tokusatsu turn out to be completely false. But every now and then, some of these turn out to have a basis in reality. On a 2017 episode of Kevin Pollak's Chat Show (link above), actor Vincent D'Onofrio, who memorably plays Leonard Lawrence (Pvt. Pyle) in Stanley Kubrick's Full Metal Jacket (1987), reveals that he prepared for the pivotal scene in which he snaps and suddenly kills R. Lee Ermey's Sgt. Hartman by watching several monster movies, including those with Lon Chaney, King Kong, and Godzilla. D'Onofrio interpreted his character as becoming a monster in that scene and so decided to prep for it by studying other movie monsters. The clip begins around the 1:09:48 mark. 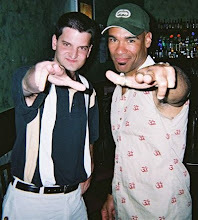 Now we just need to find out which Godzilla movies Vincent D'Onofrio watched! Signage at the Portrait of Brothers press screening. Photo by Brett Homenick. I was invited to attend a press screening of Shinichi Yanagisawa's newest film, Portrait of Brothers, which I attended today. The film is set to open in Japan on May 25. Shinichi Yanagisawa, one of the movie's stars, would be best known to readers of this blog as the comic-relief character Miyamoto in The X from Outer Space (1967), though his other work at Nikkatsu and Shochiku studios is certainly more prestigious. Yanagisawa co-stars with Choei Takahashi, who played the male lead in Toho's vampire thriller Lake of Dracula (1971). Portrait of Brothers is a drama about two elderly brothers who reunite in the small town in which they grew up after the death of their 100-year-old father. The focus is mostly on Takahashi's character, a quiet, serious man who still lives in the small countryside town in which he grew up. Yanagisawa plays the older brother, a more worldly bon vivant living in Tokyo. Yanagisawa's character returns to his hometown after their father passes away, but the completely different lifestyles of the two brothers cause more than a few clashes among them. Those who enjoy the family dramas of Yasujiro Ozu and Mikio Naruse will probably enjoy this movie. More often than not, the movie moves at a slow, deliberate pace, which will no doubt put off some Western viewers. But the portrait of countryside life in Japan in Portrait of Brothers is authentic, and if you're interested in seeing a slice of life from a point of view not often reflected in the movies, I would recommend this film. Besides, those countryside scenes are absolutely stunning. I would also like to point out that the always lovely Izumi Yukimura (the leading lady of Toho's all-star musical You Can Succeed, Too) has a brief cameo at the very end of the film. It's a very short scene, but she's always a welcome presence in any film in which she appears. The trailer for Portrait of Brothers is below. I hope those interested in Japanese cinema will give it a look. They're Back -- and Better Than Ever! Shinichi Yanagisawa. Photo by Brett Homenick. Well, it had been a while, but Shinichi Yanagisawa and His Swing All-Stars finally returned to the HUB Asakusa on Tuesday, April 16. That's because the HIB underwent some major renovations during the winter and was closed in February, when they would have held their usual performance. I got a lucky with my work schedule and was able to attend just about all three sets. It was great to see so many familiar faces again and to have a lengthy chat with Kyoichi, the saxophonist. A Toho Night to Remember! Teruyoshi Nakano. Photo by Brett Homenick. Saturday night proved to be another busy night. 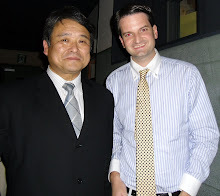 As soon as work finished, I made a beeline to another special event with Teruyoshi Nakano. And as expected, it was another fun evening. 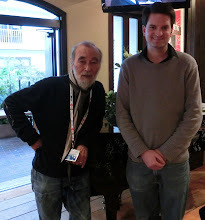 Nakano-san was eager as always to discuss his work and career. 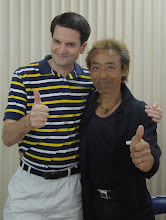 But the most fun was with SFX veteran Takashi Naganuma, with whom I shared many laughs. I've said it a million times already, but it was a great time. I always look forward to these events, and they never disappoint. REBIRTH OF MOTHRA II! The Director Joins SFX Alums for a Special Screening! Director Kunio Miyoshi. Photo by Brett Homenick. Today, I attended a special screening of Rebirth of Mothra II (1997), which was the first time I'd seen the film in many years. Overall, it was OK. I expected worse, and even though it bored me to distraction a few times, I still had a good time with it. 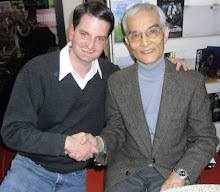 The guest of honor was Rebirth of Mothra II director Kunio Miyoshi. Prior to his helming Mothra II, e was an assistant director on Conflagration (1975) and Deathquake (1980), as well as chief assistant director on Sayonara Jupiter (1984), Reiko (1991), Godzilla vs. Mothra (1992), Godzilla vs. Mechagodzilla II (1993), Orochi the Eight-Headed Dragon (1994), Godzilla vs. Space Godzilla (1994), Godzilla vs. Destoroyah (1995), and Rebirth of Mothra (1996). Yoshifumi Shimizu. Photo by Brett Homenick. Production manager and assistant director Yoshifumi Shimizu was another guest. He worked on every Godzilla movie in the Millennium series as either assistant director or visual effects supervision assistant. 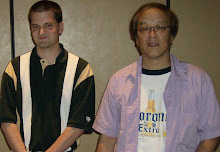 From left to right: Yosuke Nakano, Kunio Miyoshi, yours truly with a shooting script, and Toshifumi Shimizu. SFX assistant director Yosuke Nakano was another guest, as well. I really regretted having to leave the event a bit earlier than I usually do, but that's life. As brief as it all was for me, it was a heck of a good time. SHE'S BACK! Tanaka-san Takes the Stage One More Time! Yumiko Tanaka. Photo by Brett Homenick. On Saturday evening, April 6, I immediately left work to attend a special performance with actress Yumiko Tanaka. The first half of the show was a comedic stage play, and the second half was made up of various vocal performances. For the uninitiated, Tanaka-san stars in Kamen Rider Super-1 (1980-81) as Harumi Kusanami and also appears in a small role toward the beginning of Godzilla (1984) in a scene with Ken Tanaka. Eri Kanuma. Photo by Brett Homenick. Also on hand as an attendee was actress Eri Kanuma. Kanuma-san plays 007/Yoko Kato in Himitsu Sentai Goranger (1975-77), as well as appearing in episodes of Kaiketsu Lion Maru (1972-73), Inazuman Flash (1974), Spider-Man (1978-79), Battle Fever J (1979-80), and Taiyo Sentai Sun Vulcan (1981-82). 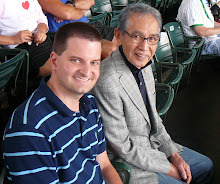 During the intermission, I had a pleasant chat with Kanuma-san. When I attended a similar event last year, Kanuma-san also attended as an attendee. She is quite supportive of her fellow actresses. Naturally, I had to take a photo with Tanaka-san and the other performers. As you can see, their costumes and makeup were elaborate. The show was a lot of fun, and I look forward to attending the next one. Cherry Blossoms Along Meguro River! It's that time of year again. On Saturday, April 6, I took a walk around Meguro River in Naka-Meguro and photographed the cherry blossoms around the river. Meguro River has become a popular destination for cherry blossom-viewing in recent years, and I think you can see why. Here are my photos. Enjoy! Attack of the Giant Teacher! Yoshikazu Ishii in November 2016. Photo by Brett Homenick. A new movie produced and directed by Yoshikazu Ishii will be coming soon, and you can watch the English-subtitled trailer below. Fans of Godzilla and Ultraman will certainly notice more than a few nods to the kaiju genre in Attack of the Giant Teacher. Check it out for yourself. Many thanks to Ishii-san for bringing his new film project to my attention. Toyoyuki Kimura poses with Ultraman Taro in November 2017. Photo by Brett Homenick. According to his What Is Youth? (1965-66) co-star Yumi Mizusawa, actor Toyoyuki Kimura, who played ZAT member Tadao Nambara on Tsuburaya Productions' Ultraman Taro (1973-74), has passed away at age 71. Prior to his role on Ultraman Taro, Mr. Kimura acted in several Toho movies during the 1960s and '70s, especially ones directed by Kihachi Okamoto, namely Fort Graveyard (1965), Epoch of Murder Madness (1967), Red Lion (1969), and Battle of Okinawa (1971).He can also be seen in The Crazy Cats' Big Explosion (1969), which was Teruyoshi Nakano's first work as special effects director. 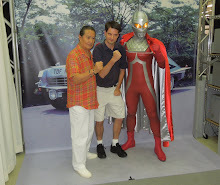 Series writer Shigemitsu Taguchi (left) poses with Toyoyuki Kimura at an event promoting the release of Ultraman Taro on Blu-ray in Japan. Photo by Brett Homenick. 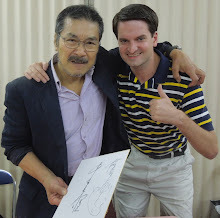 I was fortunate enough to meet Mr. Kimura at a signing event in November 2017 and had a pleasant chat with him. 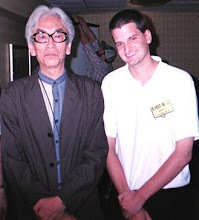 Rest in peace, Mr. Kimura. 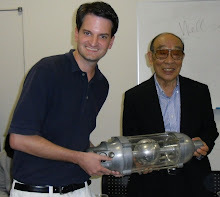 UPDATE (4/9): According to his Japanese Wikipedia page, Mr. Kimura passed away on April 3. However, there is still no cause of death given. You might have heard of Baron Munchausen. He's a character from German literature who was (in)famous for telling impossible tall tales. The best-known version of this tale is probably Terry Gilliam's 1988 movie The Adventures of Baron Munchausen. 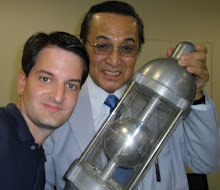 Mr. Banno announced his proposed film idea ("Godzilla 3D to the Max") to a gathering of American fans at a Roppongi dinner party in August 2004. Even though Mr. Banno told those gathered it was a secret, it didn't take long for news to leak out about his film proposal. It was the talk of fandom at the time, and with Godzilla: Final Wars on the horizon, it would give fans something to talk about while the Toho productions were on indefinite hiatus. A simple Google search can confirm this. It was never going to be a Hedorah film. It was always a Godzilla movie in which he would battle a Hedorah-like monster called Deathla. Once again, the Google machine can come in real handy here. 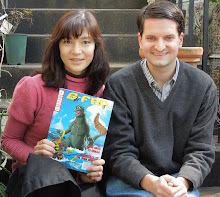 At Gfest 2005, Mr. Banno brought a producer with him to the event and hosted a presentation on "Godzilla 3D to the Max." After the con, Mr. Banno's project remained in limbo for almost five years until the Legendary Pictures deal was announced in early 2010. 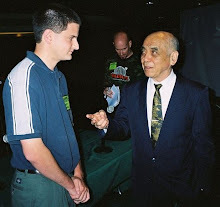 I stayed in touch with Mr. Banno after the event and remained in contact with him until just days before his passing. You probably won't be too shocked to learn that Mr. Banno never mentioned this individual to me and that he never described the evolution of his proposed Godzilla movie as anything remotely resembling the above account. So refuting it is the easy part. All that's left is to figure out why, and that's where I'm stumped. Beats me. I sincerely hope his memory is just faulty, and if so, I'm glad to have the opportunity to set him straight. But my guess is the "M" in M11 stands for Munchausen. Seeing a Dinner Show with an Old Favorite! Yutaka Hayashi. Photo by Brett Homenick. Last night, on Sunday, March 31, I went all the way out to Kisarazu, Chiba, to see a dinner show performed by Yutaka Hayashi and his band. The show took place at the Washington Hotel near the station, and it was a packed house. Other than Narita Airport, this was the farthest into Chiba I've ever been. It was certainly a new experience for me. 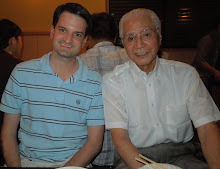 I hadn't seen Hayashi-san in almost exactly six years. I was quite eager to see him again after such a long time, so I was pleased when I was able to arrange ahead of time to visit him in the green room before the show. The show itself was a lot of fun, featuring a mixture of '60s-era American and Japanese pop songs. Hayashi-san was great on the drums, and the lead singer could belt out those American oldies extremely well. Overall, it was a great night, but I spent a long time on the train! The Return of Ultraman Gaia! Takeshi Yoshioka. Photo by Brett Homenick. Also on Wednesday, I paid another visit to the bar owned and operated by actor Takeshi Yoshioka, who played Ultraman Gaia's human alter ego on Tsuburaya Productions' Ultraman Gaia (1998-99). 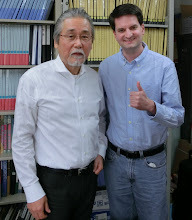 Although it had been a long time since I set foot in his establishment, Yoshioka-san immediately recognized me and commented that I'm "forever young." Hey, those were his words, not mine! It was a lot of fun hanging out with Yoshioka-san again. 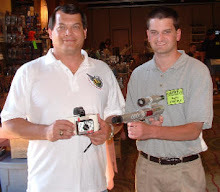 At one point, he picked up his smartphone and called Maria Theresa Gow, his Ultraman Gaia co-star, whom I've met several times. Then he handed the phone over to me for me to chat with her. That was certainly unexpected, but it was another fun memory from the evening. 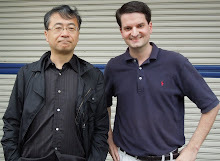 Many thanks to Yoshioka-san for his unparalleled hospitality! 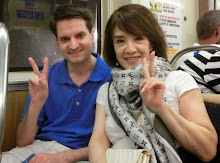 Postscript: On Saturday night (March 30), when I entered the train to go home, Ms. Gow was standing right there on the train. So we had another nice chat. Quite a coincidence! 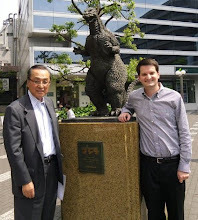 Paying a Visit to a Godzilla Scribe! Hiroshi Kashiwabara. Photo by Brett Homenick. 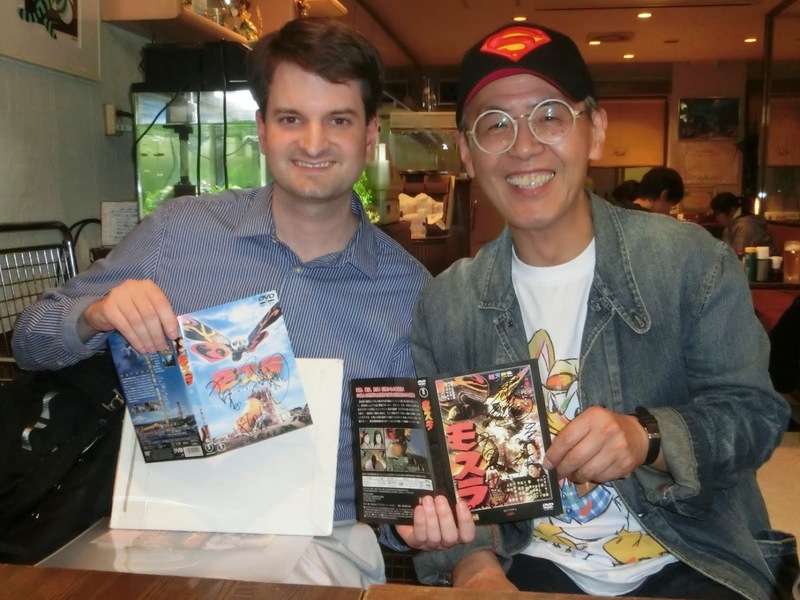 On Wednesday, March 27, I had a pleasant visit with Hiroshi Kashiwabara, a longtime movie and TV writer who wrote or co-wrote three Godzilla screenplays during the Heisei and Millennium eras. I really enjoyed our meeting. 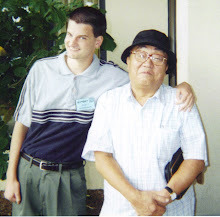 It'd been quite a while since I last saw Kashiwabara-san, and I hope to see him again soon. In between Masaki Tsuji and Fuyumi Shiraishi in September 2018. Anime voice actress Fuyumi Shiraishi passed away on March 28, 2019, at the age of 82. Born on October 14, 1936, in Beijing, China, Shiraishi-san grew up in Shizuoka Prefecture and would eventually go on to have a successful career as a voice actress, radio personality, and narrator. She even has some tokusatsu connections, having voice-acted in Ultraman Leo (1974-75) episode 40 and Super Robot Red Baron (1973-74) episode 17. A Night of Toho SFX! On Saturday, March 23, I left work and immediately headed out to another event with former Toho SFX director Teruyoshi Nakano. Naturally, it's always great to see Nakano-san, and since I couldn't attend last week's screening of Godzilla vs. Mechagodzilla, this more than made up for it. In between Teruyoshi Nakano and Takashi Naganuma. 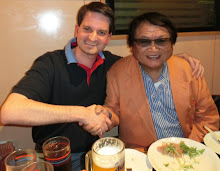 The evening ended with a brief discussion about Davy Crockett between Naganuma-san and me. I mean, isn't that a common topic of conversation these days? 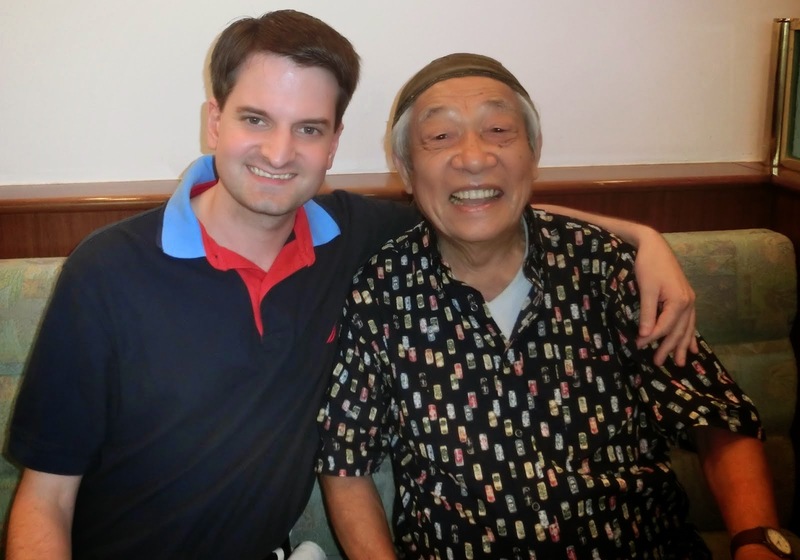 Earlier this week, on Wednesday, March 20, I had a chance to catch up with Shigeo Kato, the veteran Toho actor who began working with the studio in the early 1950s. One of his earliest roles was in Akira Kurosawa's Ikiru (1952), ans he went on to appear in numerous films for the director. Kato-san's latest film, in which he plays the main character, is set to be released later this year. I last visited Kato-san in January and was very happy to see him again. He continues to do well, and will turn 94 years old this June. I'm already looking forward to seeing him again. Yoshihiro Mori. Photo by Brett Homenick. Today I was pleased to attend a special event with a new special guest whom I'd never met before. The guest was cinematographer Yoshihiro Mori whose career in SFX productions spans several decades and covers some of Japan's most famous creations. Yoshihiro Mori began his career in the late 1950s at Toho, working on such tokusatsu classics as The Three Treasures (1959), Battle in Outer Space (1959), The Secret of the Telegian (1960), I Bombed Pearl Harbor (1960), and Mothra (1961). After working at the studio as an assistant cameraman, he quit Toho to join Toei and later worked at Tsuburaya Productions during the studios heyday, lending his talents to Ultra Q (1966), Ultraman (1966-67), Kaiju Booska (1966-67) Ultra Seven (1967-68), Time of the Apes (1974-75), and Megaloman (1979), among many others. As if Mori-san's participation weren't enough, we were joined by a surprise guest: actor Shinya Ono. 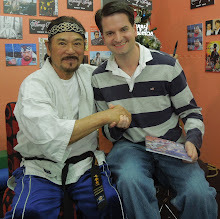 Ono-san was a regular on the TV series Wild 7 (1972-73) and Strada 5 (1974), both of which feature tokusatsu elements. Mori-san also worked on Wild 7 as a cameraman. It was a wonderful event with friendly guests. It was also interesting to hear many firsthand stories about tokusatsu shooting. TAKURO TATSUMI: From Destoroyah to Governor? With actor Takuro Tatsumi in June 2018. I came across a very interesting bit of news today. Japan's ruling Liberal Democratic Party (LDP) attempted recruiting Osaka-born actor Takuro Tatsumi to run for Osaka governor next month, but it was just announced a few hours ago that Mr. Tatsumi has decided against running. What makes this news particularly noteworthy is that Takuro Tatsumi was the star of Godzilla vs. Destoroyah (1995). Having a Godzilla movie star as Osaka governor would have been quite amusing, to say the least, but given his decision not to run, it appears it will remain just a fun thought experiment.